Small Backyard? Little Details Can Make a Big Difference! The limited amount of space in a small backyard can present a special landscaping challenge. Oftentimes people think that in order to create a beautiful yard they must be elaborate. But for small backyards that isn’t always necessary. Most often a well-thought-through design plan will make your yard look its best, regardless of its size. One of the most important things you can do for a small yard is create the illusion of sufficient space. Keep in mind that even small details can have a big impact on the overall appearance and value of your home. The first step in beautifying your small yard is to come up with a landscape design plan. Answering the questions given below will help you formulate and effectively carry out your design plan. What style are you working within? Will you need play areas for small children or pets? With your landscaping plan intact, your next step is choosing a focal point. Many times this requires thought and planning, but a breathtaking view of mountains, meadows, the sea, or other scenery may serve as a very effective focal point to enhance your small backyard. In other circumstances, if you haven’t got a view you can create one (and block out less-than-desirable nearby elements) with some small touches. For instance, in the photo shown above, the property is a very narrow city yard and the neighboring house is just over the fence. Adding a mini-pergola to the side of the deck, along with a tall outdoor fireplace, creates an inviting yet private space while blocking out the house next door. Specifically-chosen plants and flowers play a major part in the creating of a stunning small yard. Both leaf size and color are very important components when working with small spaces. Take advantage of plants with similar color shades as they can inspire a feeling of luxury. Multiple plants of the same variety can likewise produce a rich appearance, which is a desirable factor for a small yard. We’ve got a lot of vision for small-yard landscaping, so check out our Pinterest board for more ideas. Just be sure to remember: simplicity is the key! Is the thought of landscaping your small backyard overwhelming you? If so, contact the experts at Architectural Landscaping Design today! We will work with you on designs, plant varieties, and much more to bring your landscaping dreams to reality. 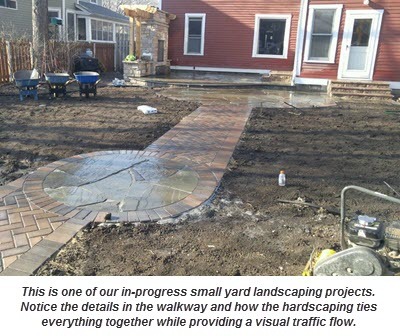 We are a licensed Minnesota landscape design, installation and maintenance contractor serving homes and businesses in the greater Minneapolis area.